For Valentine’s Day CSP got me a Claddagh ring. I’ve always wanted one and I love it so much! The one he got me has an aquamarine instead of the solid silver heart. 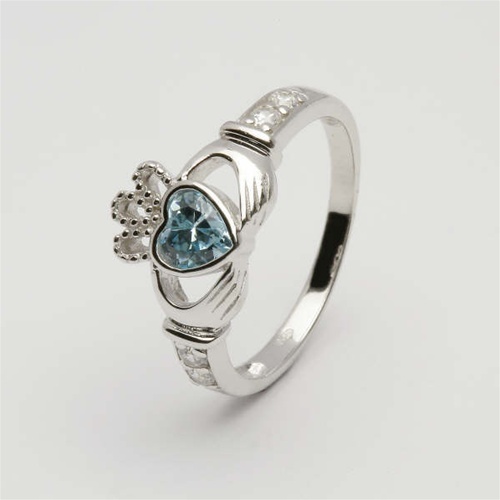 The aquamarine is the birth stone for March which is our wedding month. Ever since we got married I’ve been wanting some aquamarine jewelry to represent our wedding month. I’m second generation Irish. My paternal grandmother is Irish. She immigrated here after she married my grandfather and just became a US citizen a few years ago. I’m Irish on my maternal side too. You could probably take one look at my fish belly white skin and tell I’m Irish! I’ve always loved the story of the Claddagh rings and what they stand for. The crown represents loyalty, the heart represents love, and the hands represent friendship- all qualities you need to make a marriage successful. Custom states if you are married or taken you point the heart toward your heart. If you’re on the market you point the heart away. Like a secret code for your beloved somewhere out there in the world!